Lyon Eats: Beaujolais wine returns to Lyon! October keeps on getting better for wine drinkers in Lyon! 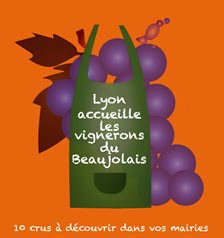 LE reader Sara reports that this Saturday, Lyon will host a city-wide rencontre with 10 crus of Beaujolais. Stop by the mairie of your arrondissement and/or Place des Terreaux to welcome winemakers from Beaujolais and their products. And yes, the "welcome" will definitely involve free tastings! Click here to get full contact information, including addresses, of your mairies. Events start around noon-ish. For more details, visit the city's official website or pick up a copy of the most recent issue of Lyon Citoyen.